We are Atlantic Canada's dealer for the world's original and longest producing manufacturer of all wheel drive motorcycles. See the stock page for more information. For over 50 years ROKONs have taken riders to places that no other vehicle can. Rugged, lightweight, with wide tires and a high ground clearance, ROKONs deliver sure-footed traction and lots of pulling power. In addition, 50 accessories complete the ROKONs unmatched versatility for work or recreational activities. 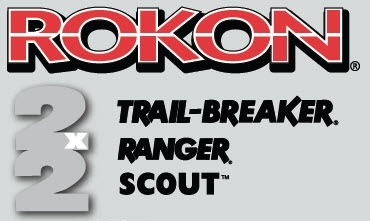 This site contains updates, pictures, and videos from the rokon.com web site, as well as from local riders. If you have anything that you would like to add, please let me know! NO shipping fee from the Factory. I do NOT charge the RIV Fee (Registrar of Imported Vehicle Fee) that you would pay upon import to Canada if buying direct from the Factory. Insurance is NOT currently mandatory in New Brunswick on off-road trail-bikes! "Taking you where you want to be."